What is NATCON and Why you should attend it? NATCON is the only yearly naturist event in Asia that is attended by Thai naturists as well as naturist people from all over the world. This coming NATCON is our 8th Annual, we have been holding this event for 8 years with the number of attendees growing each year. We come together to have fun, as well as education on how to better enjoy a naturist life, and to make naturist friends. In the year of May 2018 there were over 120 attendees to NATCON, in May 2019 we expect the number to be about 150 attendees. There will be couples, as well as singles and rooming to suit your budget and needs. Click on the poster below to BOOK NOW! NATCON 2019 - help organize it! 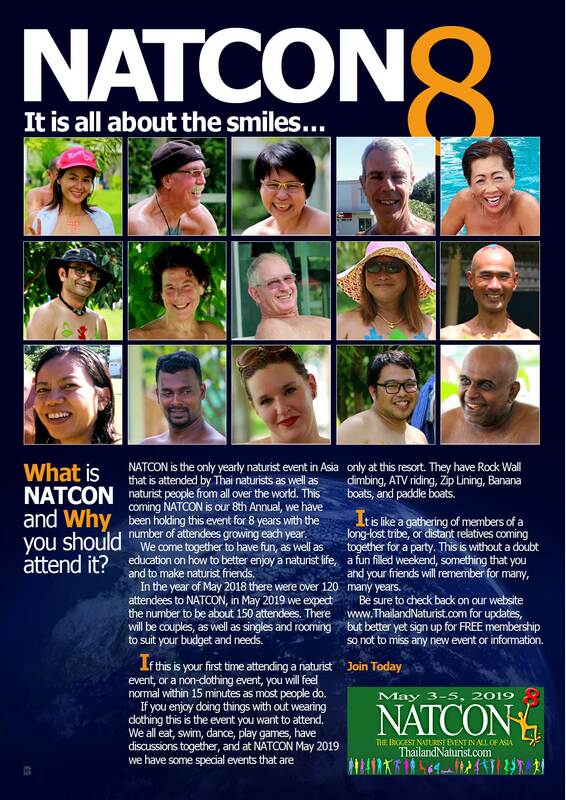 NATCON from 3 to 5 May 2019 is the biggest event for naturism in Asia. We need your help to organize the content of this event! You may be an event organizer by profession or you may be an engaged member who wants to contribute to make this event in the first weekend of May 2019 the best ever NATCON. Please email us (info@thailandnaturist.com) with a quick note saying "I am willing to help with NATCON" and we will get back to you. If you are really skilled in this kind of big events, but do not live in Bangkok, please apply anyway. We can pay for your trip and accommodation.